In an interview on Saturday, Newt Gingrich put some reality into the surreal discussion of the Middle East conflict and (as he put it) the delusional nature of the current “peace process.” The Palestinians are indeed an “invented people” — invented by the Nasser dictatorship and KGB by the way — and the Hitlerian lie that Israel occupies one square inch of “Arab” let alone “Palestinian” land needs to be buried for any clarity on what the conflict is about, let alone progress towards peace. According to CNN, a Palestinian spokesman called Gingrich’s observation that the Palestinians are “an invented people” quote “the most racist I’ve ever seen.” This just shows what brazen liars Palestinian spokesmen are. Everything that Gingrich said was obvious fact. For nearly 2,000 years “Palestine” referred to region not a people — just as “New England” refers to a region not a people. In 1948 the Arabs of the Palestine region were not talking about a Palestinian state and were not referring to themselves as Palestinians. That came in 1964 with the creation of the PLO, engineered by the KGB and the Jew-hating dictator of Egypt, Gamel Abdel Nasser​. Even then the PLO charter (which is still available on the web) (A copy is provided below also a copy of the Palestinian The PLO’s “Phased Plan”) did not call for the liberation of the West Bank or Gaza (annexed by Jordan and Egypt respectively) but for the destruction of the Jewish state. Jew hatred is what has driven the conflict in the Middle East which is more precisely described as a genocidal war against the Jews. Syrian protests have spread and grown in size, increasing the regime’s vulnerability and creating an opportunity for Iran to rebuild its leverage in Damascus. Splits within the opposition have slowed any potential progress in Yemen’s negotiations over an exit for President Ali Abdullah Saleh. Jordan’s youth protest movement has declared its intent to form a tent city in a main square while the Islamist opposition continues to resist entering into negotiations with the regime and is holding out for greater concessions. The state of unrest in Saudi Arabia and Bahrain remains mostly unchanged from last Friday, but Gulf Cooperation Council forces are unlikely to leave Bahrain until both Riyadh and Manama feel the threat of Iranian destabilization has passed. Tens of thousands of demonstrators rallied around the central al-Omari mosque in the southwestern city of Daraa on March 25, the scene of Syria’s largest and most violent protests to date since regional unrest spread to the country. Army and police had reportedly pulled back from the city center after Syrian President Bashar al Assad in a televised speech March 24 called on security forces to avoid using live ammunition, but gunfire was still reported in and around Daraa during Friday protests. Some 20 protesters were reportedly killed in the nearby town of Sanamein, according to Al Jazeera. The protesters in Daraa, a Sunni stronghold in the country, are hardening their anti-regime stance, now chanting slogans against Maher al Assad, the president’s brother and head of the elite Republican Guard, whose forces have led the crackdown in the city. Protests spread northward as well on March 25, with demonstrations reported in the capital of Damascus, where three people were reportedly killed by security forces, the nearby town of Tel, the city of Homs, the coastal city of Latakia, the northeastern Kurdish city of Wamishli and the city of Hama, the site of the 1982 massacre against the Syrian Muslim Brotherhood (MB). The protests in these areas were relatively small, however, numbering in the hundreds. But the Syrian security apparatus appears to be struggling in its efforts to intimidate protesters into keeping off the streets. The steadily growing protests in Daraa and the spread of demonstrations to other locations increase the potential for the Syrian MB to become more heavily involved in the uprising. Meanwhile, the Syrian regime appears to be in search of distractions to its domestic crisis, pointing blame at Jordan and the United States for allegedly fueling the protests. A renewed Israeli military campaign in the Gaza Strip could also prove to be a useful distraction for the al Assad government as it resorts to more violent tactics against protesters at home. Damascus remains wary of the precedent set in Libya, where Western coalition forces have mounted a military campaign in the name of protecting protesters from an extraordinarily violent crackdown. A series of high-profile defections from the regime of Yemeni President Ali Abdullah Saleh earlier in the week effectively split the country’s army and tribal landscape in two. In spite of this, the situation in Yemen was far calmer than expected March 25 after Friday prayers. The streets remain packed as Saudi-mediated negotiations continue between the various opposition factions and the Saleh government, but the opposition said it had postponed a planned march to the presidential palace until April 1. Saleh appears to have resigned himself to the fact that he will be making an early political departure, but he remains intent on making as dignified an exit as possible. He benefits in this regard from the multitude of splits within the opposition movement, which has thus far been unable to work out the details of a post-Saleh regime. Saleh is resisting the complete dismantling of his regime, trying to protect his 22 closest relatives who dominate the security, political and business apparatuses in the country. Hamid al-Ahmar, leader of the main opposition Islah party and the Hashid tribal confederation, is meanwhile trying to position himself to take over the next government. However, he faces considerable opposition from rival Baqil tribesmen as well as many in the south, who resent the al-Ahmar family for seizing their land during the Yemeni civil war. The southerners are meanwhile counting on Yaseen Saeed Noman, the former prime minister of now-defunct South Yemen, to counterbalance the northerners. Concerns have also been raised that Gen. Ali Mohsen al-Ahmar, commander of Yemen’s northwestern military division and 1st Armored Division who defected early in the week, is looking to assert military rule, though al-Ahmar so far claims that is not his intent. Negotiations are under way over a compromise that would reportedly lead to the resignations of Saleh and al-Ahmar as well as the creation of a transitional council representing Yemen’s various interest groups until elections can be held, but so far the talks have not led to any breakthroughs. Sorting out the details of such an arrangement through Yemen’s fractured political landscape will be an enormous challenge for Saudi mediators, especially with the Saleh family so deeply entrenched in the regime, tribal tensions simmering and the potential for more serious clashes between rival security forces looming. Though protests have been occurring regularly in Jordan since January, there has been a noticeable escalation of tensions in recent days between demonstrators and government supporters as well as security forces. The main reason for this is that youth protesters are trying to create a tent city of their own in downtown Amman, similar to what was seen in main squares in Cairo, Manama and Sanaa. A pro-democracy protest group originally known as the Jordanian Youth Movement has rechristened itself the “March 24 Youth” and declared March 24 that they would not leave Gamal Abdel Nasser Square, aka Interior Ministry Circle, until their demands are met. They have called for the immediate resignations of newly appointed Prime Minister Marouf al-Bakhit and General Intelligence Directorate head Lt. Gen. Muhammad al-Raqqad as well as the dissolution of parliament. Like the Al Wefaq movement in Bahrain, they are not pushing for the overthrow of the monarchy but do want significant political reforms that would weaken the power of King Abdullah II. The Jordanian government responded with force to the attempted establishment of a permanent encampment in the square. It likely learned from the Egyptian, Bahraini and Yemeni examples that allowing a large tent city to materialize would eventually either lead to a violent episode that would only inflame the situation or would allow the protests to take on a life of their own. Roughly 400 government supporters, likely paid by Amman, attacked the 1,500-2,000 demonstrators in the square on both March 24 and March 25, throwing stones at them. Security forces allowed the clashes to go on for a while before using water cannons to disperse the groups on March 25, and authorities reportedly even clashed with the anti-government protesters themselves. According to reports, one person has been killed and more than 100 have been injured. The role of the Islamist opposition in the Jordanian unrest remains unknown, and they do not appear to have been involved in the clashes of the past two days. Al-Bakhit accused them of responsibility for the clashes late March 25, adding that they had received help from elements living in Egypt and Syria. It is more likely, however, that the Jordanian MB’s political wing, the Islamic Action Front (IAF), is following the Egyptian MB’s example, allowing youth protest groups to take the lead in demonstrations while it moves toward negotiations on the sidelines with the regime. Thus far the IAF has resisted an invitation from the king to take part in the newly created National Dialogue Committee, however. Jordan, like Bahrain, is a key regional ally of the United States, which is why U.S. Secretary of Defense Robert Gates traveled to Amman on March 25 to meet with King Abdullah II. U.S. Central Command chief Gen. James Mattis was also in attendance, one day after the Bahraini crown prince held meetings of his own with the Jordanian monarch. There have been no reports as to what may have been discussed in either of these meetings, but Washington is likely trying to reassure Amman that it will stand by the regime, while simultaneously urging it to speed up the pace of reforms so as to stave off continued unrest. A reported shooting at the home of a Jordanian member of parliament March 25, which did not result in any injuries, has raised concerns that other elements are trying to dramatically escalate tensions in the country. Though Shiite demonstrators took to the streets in Saudi Arabia’s Eastern Province once again this Friday to call for prisoner releases and the withdrawal of Gulf Cooperation Council (GCC) forces from Bahrain, the demonstrations were again relatively small in comparison to what has been seen elsewhere in the region. Demonstrators numbering in the hundreds marched in at least two villages, Rabiae and Awamiya, near the city of Qatif, and there were no reported clashes between riot police and protesters. This does not mean, however, that security is not extremely tight throughout the kingdom at the moment, particularly in Shiite areas in the east, where Saudi human rights activists allege more than 100 demonstrators have been arrested over the past week in Safwa, Qatif and al-Ahsa. Across the causeway in Bahrain, the situation has cooled considerably since the March 16 crackdown by GCC forces. But Riyadh is still concerned about the potential for protests to re-escalate in Bahrain. A state of emergency declared March 15 has prohibited public gatherings, but Friday prayers bring people out into the streets regardless. Moreover, some online activists had called for another “Day of Rage” in the country March 25, with plans for demonstrations in nine locations. Though security forces did use tear gas on one group of protesters and one person was reportedly killed, the Day of Rage largely fizzled. Tight security was one reason: Fighter jets and police helicopters patrolled the skies on Friday as security forces erected several checkpoints on major highways to search people’s cars. But a more significant factor was the lack of support for the demonstrations by the largest Shiite opposition group, Al Wefaq. Al Wefaq’s spiritual leader, Sheikh Isa Qassim, did perform the Friday prayers March 25 in the village of Diraz, reportedly drawing more than 1,000 people. But while he reiterated the people’s determination to continue demonstrating until their demands have been met, he again declined to escalate the situation by calling for the overthrow of the regime. While the extent of Iranian involvement in the Bahraini protests remains unknown, the al-Khalifa regime has noticeably increased its rhetoric over the past week, alleging that Tehran is directing the demonstrations. This has occurred despite the situation’s having calmed significantly since the leaders of the hard-line Shiite Coalition for a Republic, which is believed to have close links with Tehran and has advocated the total overthrow of the regime, were detained March 17. Until the al-Khalifas, as well as the Saudis, feel that there is not a threat of Iranian destabilization, they will be unlikely to call for the withdrawal of the GCC troops that are helping to provide security in Bahrain. Recent incidents in Israel, including a third day of rocket and mortar fire from Gaza and a March 23 bombing at a Jerusalem bus station, reflect heightened tensions in a country that had been conspicuously quiet amid the regional unrest. There are signs that at least some Palestinian factions are deliberately attempting to provoke Israel into a renewed offensive in Gaza. It is not clear what will happen as the crisis intensifies in Israel, but a military operation against Gaza could become a rallying point for protest movements across the Middle East. Artillery rockets and mortar rounds fired from Gaza continued to fall on Israeli territory March 24, with some eight artillery rockets falling March 24. This follows similar incidents of rocket and mortar fire March 22-23. These incidents, along with a March 23 bombing at a Jerusalem bus station, the brutal March 11 stabbing deaths of an Israeli family in a West Bank settlement and recent Israeli military strikes on Gaza (including four retaliatory airstrikes March 24), represent renewed tensions in a country that had until now been conspicuously quiet amid the regional unrest. At least some Palestinian factions appear to be attempting to provoke Israel into a military engagement in Gaza, and Israeli Defense Minister Ehud Barak made it clear March 24 that Israel considered Hamas responsible for all rocket and mortar fire from Gaza. Given the steady escalation of attacks, plans for such a military campaign could now be under way. Past Israeli military operations in the Gaza Strip, particularly Operation Cast Lead in 2008-9, allow groups like Hamas and Palestinian Islamic Jihad (PIJ) to rally Arabs around an anti-Israeli campaign. Iran has also used such conflicts to present itself as the true Islamic vanguard of the Palestinian resistance, in contrast to the Arab regimes in Egypt and Jordan that would rather see the Palestinians kept in check. Egypt, in particular, is caught in a dilemma of having to publicly condemn Israel while clamping down on border crossings from the Sinai to Gaza for security reasons and cooperating quietly enough with the Israelis to ensure that an outpouring of support for Hamas does not embolden the Egyptian Muslim Brotherhood (MB) at home. The current environment amplifies this dynamic. Coming out of its own political crisis, Egypt’s military-led government has given every indication that it intends to honor the Egypt-Israel peace treaty and continue cooperating with Israel in containing Gaza militancy. At the same time, the Egyptian government is also still trying to manage a shaky political transition in lead-up to elections in September that are being eyed by the MB as a historic opportunity to gain political power. So far, the military has maintained a positive image with the majority of the Egyptian public, but this could change if the MB uses a possible Israeli military campaign in Gaza to redirect public ire at the military for exacerbating the plight of Gazans. The political rise of the MB works to the advantage of Hamas, an Islamist movement that grew out of the MB. Hamas is hoping the political dynamic in Cairo shifts to one more amenable to Hamas’ interests and less cooperative with Israel, adding to the group’s long-term survivability. Public and private statements by Hamas leaders give the impression that the group was not involved in the bus bombing but endorses the attack as a response to Israeli aggression. PIJ, meanwhile, has claimed responsibility for many of the rocket attacks. Claims and denials should not be taken at face value; many Palestinian groups, especially Hamas, prefer to use front groups while maintaining plausible deniability. An escalation in the Palestinian territories plays to the Iranian agenda, but the extent of Iranian involvement in this building crisis remains unclear. PIJ, out of all the Palestinian militant factions, is the closest to Iran. Hamas is also known to receive some support for Iran but would publicly avoid being cast as another Iranian militant proxy. Other groups like the al-Aqsa Martyrs Brigade-Imad Mughniyah, which claimed the March 11 West Bank attack, are believed to be the product of Iran and Hezbollah. Hezbollah has so far remained quiet but must be watched closely for signs that it, too, is looking to open a front with Israel. Several of the rockets fired from Gaza significantly exceeded the range of the BM-21 Grad, which was first fired by militants from within Gaza in 2007. Grads and the Qassam, the staple of Gaza militancy, continue to be in play, along with shorter-range mortar fire. However, during Operation Cast Lead, Iranian-made Fajr-3 or artillery rockets of similar size began to crash down much farther into Israeli territory than previous rockets from Gaza. The Fajr-3 has a range of 45 kilometers (28 miles), double that of a Grad and more than quadruple that of the best Qassams. This range allows rockets fired from Gaza to impact much deeper into the heart of Israel and into more densely packed population centers outside Jerusalem and Tel Aviv. However, there is still a considerable buffer between the cities themselves and demonstrated capability out of Gaza, and even the farthest of the March 22-24 rocket strikes — largely in the direction of Tel Aviv — have still fallen short of the city itself. It will be important to distinguish between sporadic Qassam attacks and consistently targeted ones — especially ones using Grad and Fajr-3 rockets to threaten more densely populated and sensitive areas of Israel. Sustained attacks with these longer-range rockets, which by their nature are harder to smuggle into and use in Gaza than the Qassams, may indicate a deliberate effort to instigate a conflict in which Israel responds with a characteristically heavy hand, not only bringing international condemnation upon itself but also becoming a rallying point for regional unrest — especially in Egypt. The one new Israeli counter is the preliminary deployment of the Iron Dome counter-artillery rocket system. The system is inappropriate for defending against every mortar and Qassam to fly out of Gaza, but the Grad and Fajr-3 fall squarely within its designed engagement envelope — if the small number of existing batteries are active and appropriately positioned. However, this system was set to be operational in February, but the status — much less disposition — of the first batteries is unclear, and there have not yet been any reports of its use. Its effectiveness thus remains to be seen, but experience during this current inflammation of Israeli-Palestinian tensions will likely play a role in refining and working toward a more robust shield. In any event, for this conflict at this time, it will not fundamentally change the military dynamic. It is not clear what will happen as the crisis intensifies in Israel. But if it does escalate considerably, the Israeli-Palestinian conflict could rapidly become the focal point of the unrest in the Middle East. U.S. Secretary of Defense Robert Gates met with his Israeli counterpart, Ehud Barak, Thursday. There was no shortage of issues for the defense officials to discuss amid what appears to be an impending Israeli military operation in Gaza; gradually building unrest in Syria; and the fear of an Iranian destabilization campaign spreading from the Persian Gulf to the Levant. Any of these threats developing in isolation would be relatively manageable from the Israeli point of view, but when taken together, they remind Israel that the past 32 years of relative quietude in Israel’s Arab backyard is anything but the norm. Israel is a small country, demographically outnumbered by its neighbors and thus unable to field an army large enough to sustain long, high-intensity conflicts on multiple fronts. Israeli national security therefore revolves around a core, strategic need to sufficiently neutralize and divide its Arab neighbors so that a 1948, 1967 and 1973 scenario can be avoided at all costs. After 1978, Israel had not resolved, but had greatly alleviated its existential crisis. A peace agreement with Egypt, ensured by a Sinai desert buffer, largely secured the Negev and the southern coastal approaches to Tel Aviv. The formalization in 1994 of a peace pact with Jordan secured Israel’s longest border along the Jordan River. Though Syria remained a threat, by itself it could not seriously threaten Israel and was more concerned with affirming its influence in Lebanon anyway. Conflicts remain with the Palestinians and with Hezbollah in Lebanon along the northern front, but these do not constitute a threat to Israeli survival. The natural Israeli condition is one of unease, but the past three decades were arguably the most secure in modern Israeli history. That sense of security is now being threatened on multiple fronts. To its west, Israel risks being drawn into another military campaign in the Gaza Strip. A steady rise in rocket attacks penetrating deep into the Israeli interior over the past week is not something the Israeli leadership can ignore, especially when there exists heavy suspicion that the rocket attacks are being conducted in coordination with other acts of violence against Israeli targets: the murder of five members of an Israeli family in a West Bank settlement less than two weeks ago, and the Wednesday bombing at a bus station in downtown Jerusalem. Further military action will likely be taken, with the full knowledge that it will invite widespread condemnation from much of the international community, especially the Muslim world. The last time Israel Defense Forces went to war with Palestinian militants, in late 2008/early 2009, the threat to Israel was largely confined to the Gaza Strip, and while Operation Cast Lead certainly was not well received in the Arab world, it never threatened to cause a fundamental rupture in the system of alliances with Arab states that has provided Israel with its overall sense of security for the past three decades. This time, a military confrontation in Gaza would have the potential to jeopardize Israel’s vital alliance with Egypt. Hamas, the Palestinian Islamic Jihad (PIJ) and others are watching Egypt’s military manage a shaky political transition next door. The military men running the government in Cairo are the same men who think that maintaining the peace with Israel and keeping groups like Hamas contained is a smart policy, and one that should be continued in the post-Mubarak era. The Egyptian Muslim Brotherhood, part of an Islamist movement that gave rise to Hamas, may have different ideas about the treaty; it has even indicated as much during the political protests in Egypt. An Israeli military campaign in Gaza under the current conditions would be fodder for the Muslim Brotherhood to rally the Egyptian electorate (both its supporters and people who may otherwise vote for a secular party) and potentially undermine the credibility of the military-led regime. With enough pressure, the Islamists in Egypt and Gaza could shift Cairo’s strategic posture toward Israel. This scenario is not an assured outcome, but it is likely to be on the minds of those orchestrating the current offensive against Israel from the Palestinian territories. To the north, in Syria, the minority Alawite-Baathist regime is struggling to clamp down on protests in the southwest city of Deraa near the Jordanian border. As Syrian security forces fired on protesters who had gathered in and around the city’s main mosque, Syrian President Bashar al Assad, like many of his beleaguered Arab counterparts, made promises to order a ban on the use of live rounds against demonstrators, consider ending a 48-year state of emergency, open the political system, lift media restrictions and raise living standards – all promises that were promptly rejected by the country’s developing opposition. The protests in Syria have not reached critical mass due to the relative effectiveness of Syrian security forces in snuffing out demonstrations in the key cities of Damascus, Aleppo, Homs and Hama. Moreover, it remains to be seen if the Syrian Muslim Brotherhood, which led a violent uprising beginning in 1976 aiming to restore power to the Sunni majority, will overcome its fears and join the demonstrations in full force. The 1982 Hama crackdown, in which some 17,000 to 40,000 people were killed, forced what was left of the Muslim Brotherhood underground and is still fresh in the minds of many. Though Israel is not particularly keen on the al Assad regime, the virtue of the al Assads, from the Israeli point of view, is their predictability. A Syria more concerned with wealth and exerting influence in Lebanon than provoking military engagements to its south, is far more preferable than the fear of what may follow. Like in Egypt, the Muslim Brotherhood branch in Syria remains the single largest and most organized opposition in the country, even though it has been severely weakened since the massacre at Hama. To the east, Jordan’s Hashemite monarchy has a far better handle on its political opposition (the Muslim Brotherhood (MB) in Jordan is often referred to as the “loyal opposition” by many observers in the region,) but protests continue to simmer there and the Hashemite dynasty remains in fear of being overrun by the country’s Palestinian majority. Israeli military action in Gaza could also be used by the Jordanian MB to galvanize protesters already prepared to take to the streets. Completing the picture is Iran. The wave of protests lapping at Arab regimes across the region has created an historic opportunity for Iran to destabilize its rivals and threaten both Israeli and U.S. national security in one fell swoop. Iranian influence has its limits, but a groundswell of Shiite discontent in eastern Arabia along with an Israeli war on Palestinians that highlights the duplicity of Arab foreign policy toward Israel, provides Iran with the leverage it has been seeking to reshape the political landscape. Remaining quiet thus far is Iran’s primary militant proxy, Hezbollah, in Lebanon. As Israel mobilizes its forces in preparation for another round of fighting with Palestinian militants, it cannot discount the possibility that Hezbollah and its patrons in Iran are biding their time to open a second front to threaten Israel’s northern frontier. It has been some time since a crisis of this magnitude has built on Israel’s borders, but this is not a country unaccustomed to worst case scenarios. I endorse Jonathan Tobin’s points on the need to prevent arms smuggling into Gaza, and would like to add another one. Americans, situated on the other side of the globe, have rarely considered it, but in light of the growing instability in the Middle East, it’s time we did. 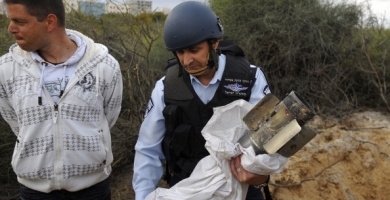 Israel’s interdiction of arms shipments to terrorists is not just a boon to Israel. It’s a boon to regional stability. Gaza is not the only destination for smuggled arms; Lebanon is the other principal one. When the IDF intercepted M/V Francop in November 2009, the arms disguised as commercial cargo were bound for Beirut. Israel cannot intercept arms shipments on every axis — e.g., at the Syrian border with Lebanon — but denying particular arms shipments to terrorists is not necessarily the most important effect of the Israeli policy. That effect is, rather, the imposition of boundaries on the scope and character of the instability created by Hamas, Hezbollah, and Iran. Without Israel’s enforcement of those effective boundaries, the impact of the terror regimes in Gaza and southern Lebanon would be considerably greater on Egypt and Jordan, at a minimum. If an Iranian-sponsored arms pipeline through Sudan to Gaza had been allowed to prosper, it would have further destabilized and polarized that already war-torn nation. Saudi Arabia, opposing Iran’s busy career on two sides of Israel, would consider it even more urgent to arm and cultivate Sunni Arab factions, hoping to organize Egypt and Jordan against the Iran-Syria coalition. Israeli enforcement of the Gaza blockade, and Jerusalem’s policy of interdicting arms shipments to Hezbollah, are some of the key measures preventing Iran from consolidating advantage in Gaza and Lebanon. They also serve to discourage the widening of the terrorists’ operating theater and logistics range. That range can only be widened into the territory of neighboring nations, forcing those nations into overt policy choices — choices about whom to side with and what armed efforts to support or actively oppose — that they can address today with ambivalence. It’s a good mental exercise to imagine the state of regional stability if there were no arms blockade of Gaza and no Israeli vigilance over southern Lebanon. Only Iran and the terrorists would derive advantage from the proliferation of arms and the potential for chaos. Certainly the Gazan and Lebanese civilians would not. And no regional nation would be immune to the reverberations outward from the Levant. The Bahraini national guard and Public Security Force initiated an operation to clear “outlaws” from several public areas in Manama, the General Command of the Bahrain Defense Force said March 16, BNA reported. The operation targeted protesters in the Bahrain Financial Harbour, the Salmaniya Medical Complex and surrounding areas, and the Gulf Cooperation Council Roundabout. The roundabout has previously been referred to as Pearl Square, or Martyr’s Square by the protesters. Iranian President Mahmoud Ahmadinejad said he could not understand how a government that would use weapons against its own people would want to govern them, Ahram Online reported March 16, citing Iranian state media. The statement is in reference to the ongoing political unrest in Bahrain. Military intervention and the use of force against a peaceful popular movement will not lead to a solution in Bahrain, according to a March 16 statement from Hezbollah, Ahram Online reported. Shiite lawmakers in Kuwait strongly criticized the Gulf Cooperation Council’s (GCC) decision to deploy troops to help quell the protests in Bahrain, Ahram Online reported March 16. One lawmaker threatened to question Kuwaiti Prime Minister Sheikh Nasser Muhammad al-Ahmad al-Sabah if he deployed troops to Bahrain. The Iranian parliament will launch an investigation into the suppression of anti-government protesters in Bahrain, Press TV reported March 16. During a closed-door meeting, Iranian lawmakers expressed concern over the killing of Bahraini protesters and the deployment of Saudi and UAE forces, according to a spokesman for the parliament’s presiding board. Khalil Marzouk, deputy head of the al Wefaq movement and a member of parliament, said the movement now has three martyrs, referring to the three protesters that Bahraini police killed in the capital’s Pearl Square, AFP reported March 16. Marzouk said the police were barring access to many hospitals in the capital, both public and private. He said most of the villages around Manama are surrounded. Twelve Shariah court judges in Bahrain resigned from their posts March 16 in response to police attacks against demonstrators at Manama’s Pearl Square, Al-Wasat reported. Given the excessive use of force against unarmed citizens, the judges of will resign from the judicial council in al-Jaferia region, according to a statement released by the judges. Supporters of Shiite leader Muqtada al-Sadr demonstrated March 16 in various parts of Iraq in support of Bahraini Shiite protesters, Middle East Online reported. About 2,000 gathered in Sadr City in eastern Baghdad carrying Bahraini and Iraqi flags and banners reading, “Bahrain is free, free, oppressor, get out.” Two hundred demonstrators from the al-Sadr Trend marched in An Najaf, south of Baghdad, condemning violence against unarmed Bahrainis. About 500 al-Sadr supporters marched from the Tamimiya area of Basra carrying Iraqi flags and pictures of al-Sadr and his father. Tens of protesters rallied in Ad Diwaniyah, near An Najaf, in support of the Bahraini people, Alsumaria reported. Iraqi Grand Ayatollah Ali al-Sistani on March 16 urged Bahrain’s government to stop the use of violence against unarmed protesters and expressed concern about government measures, Al-Iraqiya TV reported. Iraqi Prime Minister Nouri al-Maliki also voiced concern over events in the country and the foreign intervention there, saying the presence of foreign forces will complicate the regional situation rather than resolve it. Saudi King Abdullah received a telephone call March 16 from U.S. President Barack Obama, SPA reported March 16. The leaders discussed bilateral relations and developments in the Middle East, including the situation in Bahrain. Kuwaiti National Assembly Speaker Jassem al-Kharafi said March 16 that Bahraini leaders are worthy of trust and that dialogue between the the two parties is necessary in order to end the current turmoil in the country, KUNA reported. Approximately 2,000 mostly Shiite protesters gathered March 16 in central Beirut in support of protests by Bahrain’s Shiite majority, Reuters reported. Protesters waved Lebanese and Bahraini flags and carried banners of Lebanese Shiite group Hezbollah, which orchestrated the demonstration, as they chanted slogans for sweeping change in the Middle East. A Hezbollah lawmaker who was allegedly jailed in Bahrain for 18 years said Bahrainis were both civilized and peaceful in demanding their rights. Both Sunni and Shiite religious figures attended the rally. A parliamentarian from Bahrain’s opposition group Al Wefaq said there are divisions within the ruling authority of Bahrain, Iranian Al Alam TV reported March 16. Seven members of the Shura council who were appointed by King Hamad bin Isa al-Khalifa resigned March 16 to dispute the suppression of the protesters and protest the intervention of foreign forces in internal affairs. Bahrain and four Gulf Cooperation Council countries that sent troops to put down anti-government protests in Bahrain are “on the wrong track,” U.S. Secretary of State Hillary Clinton said in a CBS interview March 16, Reuters reported. Calling events in Bahrain “alarming,” Clinton said there was no security solution to the people’s demands. Bahrain must negotiate a political agreement, Clinton said. Iranian Foreign Minister Ali Akbar Salehi on March 16 spoke with his counterparts in Iraq and Syria and with Kuwait’s deputy prime minister after UAE and Saudi forces entered Bahrain to put down protests, Mehr reported. The officials discussed the importance of international consultations to prevent a humanitarian crisis in Bahrain and exchanged views on the foreign intervention and its consequences. Syrian Foreign Minister Walid al-Moallem soon will visit Tehran. Jordan supports the decision to send Saudi and Gulf Cooperation Council (GCC) forces to Bahrain, Jordanian Foreign Minister Nasser Judeh said March 16 in a statement carried by Petra news agency, DPA reported. Jordan fully supports “all sovereign decisions” by GCC member states, particularly those intended to safeguard stability and security, Judeh said. Jordan considers the undermining of Bahrain’s stability and security, or that of any other GCC state, as a redline, Judeh added. Where Is The Outcry Against Arab Apartheid? Mohammed Nabil Taha, an 11-year-old Palestinian boy, died this week at the entrance to a Lebanese hospital after doctors refused to help him because his family could not afford to pay for medical treatment. The tragic case of Taha highlights the plight of hundreds of thousands of Palestinians who live in impoverished refugee camps in Lebanon and who are the victims of an Apartheid system that denies them access to work, education and medical care. Ironically, the boy’s death at the entrance to the hospital coincided with Israel Apartheid Week, a festival of hatred and incitement organized by anti-Israel activists on university campuses in the US, Canada and other countries. It is highly unlikely that the folks behind the festival have heard about the case of Taha. Judging from past experiences, it is also highly unlikely that they would publicize the case after they heard about it. Why should anyone care about a Palestinian boy who is denied medical treatment by an Arab hospital? This is a story that does not have an anti-Israel angle to it. Can anyone imagine what would have happened if an Israeli hospital had abandoned a boy to die in its parking lot because his father did not have $1,500 to pay for his treatment? The UN Security Council would hold an emergency session and Israel would be strongly condemned and held responsible for the death of the boy. All this is happening at a time when tens of thousands of Palestinian patients continue to benefit from treatments in Israeli hospitals. Last year alone, some 180,000 Palestinians from the West Bank and Gaza Strip entered Israel to receive medical treatment. Many were treated despite the fact that they did not have enough money to cover the bill. In Israel, even a suicide bomber who is — only! — wounded while trying to kill Jews is entitled to the finest medical treatment. And there have been many instances where Palestinians who were injured in attacks on Israel later ended up in some of Israel’s best hospitals. Lebanon, by the way, is not the only Arab country that officially applies Apartheid laws against Palestinians, denying them the right to receive proper medical treatment and own property. Just last week it was announced that a medical center in Jordan has decided to stop treating Palestinian cancer patients because the Palestinian Authority has failed to pay its debts to the center. Other Arab countries have also been giving the Palestinians a very hard time when it comes to receiving medical treatment. It is disgraceful that while Israel admits Palestinian patients to its hospitals, Arab hospitals are denying them medical treatment for various reasons, including money. But then one is reminded that Arab dictators do not care about their own people, so why should they pay attention to an 11-year-old boy who is dying at the entrance to a hospital because his father was not carrying $1,500? But as the death took place in an Arab country – and as the victim is an Arab – why should anyone care about him? Where is the outcry against Arab Apartheid? Analysis: It is clear that the Middle East will go through years of instability. The Arab world of tomorrow will be very different from what we knew. After decades of oppression, Arab masses are on the move. They have discovered that they can change their fate. Not all regimes will crumble, but they all will have to implement substantial reforms and allow a measure of freedom of expression as well as greater respect for human rights. This does not mean that the core elements which characterized the political, economic, social and religious framework of Arab nations will disappear overnight. These nations will have to overcome the legacy of centuries of backwardness and fight beliefs and faiths which have molded them since the dawn of Islam. Will revolutions free them from tribal and client systems which still prevail in Arab societies? Will discrimination and oppression against women cease? What about the high percentage of the population which is partially or totally illiterate? It is doubtful that they can take a meaningful role in shaping democratic values or initiate economic progress. Many questions and too few answers. It is unfortunately clear that the Middle East will go through years of instability before the new regimes can find the right balance between the demands of the emerging political forces and those of traditional Arab societies. The revolutions are far from over and the masses will fill the streets time and time again to protest measures taken by the new regimes or the reforms instituted by the old regimes which survived. Radical elements will try to divert these multitudes to their own ends and thus hijack the revolutions. Such is the way of popular revolutions until they peak and die. Look at the path taken by the French Revolution or the Russian Revolution. However, through this fog of uncertainty a few facts have emerged. The first is that the Palestinian issue had no part in getting the masses into the streets. Here and there opposition forces tried – and are still trying – to get the people to demonstrate against Israel because of the intifada or the wars against Hamas in Gaza or Hezbollah in Lebanon, but with very little success. The Israeli question, used for decades by Arab rulers to focus their peoples’ attention away from their sorry economic state, is now revealed for what it was: just a ploy. A similar conclusion can be drawn on the subject of radical Islam on both of its main aspects, the jihadist organizations and the Muslim Brotherhood. Neither was able to inflame the masses and lead them to topple the regimes. Al-Qaida and its offshoot jihadist organizations did manage to conduct countless terror attacks in Arab countries and carried out extensive campaigns of incitement through the Internet, in the mosques and with the help of satellite channels such as Al-Jazeera, but all they could achieve was to recruit a few thousand youths. Al-Qaida and the like were never an alternative to the regimes in Arab countries, with the possible exception of Somalia, where the central government was toppled years ago and anarchy now reigns. The most they could do was to whip the crowds into a frenzy against the West following the publication of the Muhammad drawings in a Danish newspaper. The Muslim Brotherhood, active for decades in Arab countries, is working openly to create an Islamic regime and is regarded as a permanent threat in the Arab world. Yet it has failed – up to now – to achieve its goal. It was for economic reasons that in Egypt and Tunisia students and unemployed belonging to the lower middle classes started to demonstrate. The Muslim Brothers did not join them at first, thinking, wrongly as it turned out, that the demonstrations would fail and taking part in them would not further their objectives. They realized their mistake fairly quickly and did join the protesters, but kept a low profile. On the other hand, the fact that the movement’s foremost theologian, Yusuf al- Qaradawi, was allowed to conduct Friday prayers in Tahrir Square, where hundreds of thousands had gathered, testified to the fact that the Brothers had been busy behind the scenes. They now have representatives on the committee that was set up to amend the constitution, and they have managed to block the cancellation of Article 2, which states that Islam is the country’s religion and that Shari’a is the principal source of law. In other words, the Army Supreme Council had decided to adopt a conciliatory attitude towards the Muslim Brothers – having come to the conclusion that they constituted a well-organized political force, but also that for the present Egyptians on the whole wanted to preserve the Islamic nature of their country. In Tunisia, though the leader of the Brotherhood, Rashid Ghannushi, came home after 20 years in exile, the organization does not seem to play a meaningful role in the ongoing revolution. It is probably due to the success of president Habib Bourguiba and his successor Zine El Abidine Ben Ali in curtailing the movement, which led to an increased Western influence. The exact opposite has occurred in Jordan, where the Brothers are the main force against the regime, though at the moment King Abdullah’s throne appears secure enough. Regarding Libya the situation is unclear but it does seem that Islamists make up one of the strongest elements against Muammar Gaddafi. What is no less interesting is that the Muslim Brothers themselves are affected by the currents washing over the Arab world. In Egypt, a group of young bloggers who are members of the movement are calling for a demonstration on March 17 in front of the Brothers’ Cairo offices. They demand the resignation of the group’s supreme guide, Mohammed Badie, who was elected barely a year ago, the dissolution of all the movement institutions, and free and transparent elections. These are extreme demands striking at the heart of the Brotherhood and they could not have been formulated even a month ago; the bloggers affirm that no fewer than 30,000 members have voiced their support and will demonstrate. They intend to form a political party which shall be called “Freedom and Justice,” a satellite television channel as well as daily and weekly newspapers. In other words, they want to be an influential part of the process. The Brotherhood has always been known for its unswerving, dogmatic positions on theological matters; at this stage it is not clear what the winds of change will bring to the almost century-old movement. There are therefore a great number of unknowns in the unrest spreading over the Arab world. Will Islamists succeed in setting up “moderate” Islamic political parties, and how “moderate” would they really be? And what will happen in Saudi Arabia? The king is 87; he is just back from the United States and Morocco after a difficult surgery for a slipped disc. He immediately ordered to give every family $500, a move seen as trying to placate the people ahead of trouble, but which falls woefully short. Saudi Arabia is not better prepared against revolutions than other Arab countries. Most of the huge oil revenues go to the 20,000 princes who lord them over the masses. Poverty and unemployment are rife and the extravagant lifestyle and corruption of the rulers is a source of powerful resentment. The Shi’ite minority suffers from oppression and discrimination; it is to be found in the east of the country – where most oil reserves are situated – close to Bahrain, a kingdom where the Shi’ite majority is trying to overthrow the Sunni royal family. Will Saudi King Abdullah be wise enough to give up some of his privileges to pacify both the masses and the Shi’ite minority? He has made in the past a few minor reforms in the field of education, but nothing to deal with the real problems. He undoubtedly worries about events in Bahrain, Yemen and Oman – his nearest neighbors suffering from the same ills. On the other hand, he may be relying on the traditional alliance between the royal family and the Wahabi religious establishment, though that alliance may falter in front of an Egyptian-style revolution. For the moment the kingdom welcomes fallen dictators such as Ben Ali and has offered sanctuary to Mubarak. President Barack Obama’s most recent declaration about welcoming changes within existing regimes is being seen as tacit support for the embattled oil-rich kingdoms. When all is said and done, the main question today is how, and in what measure, if at all, can Islamic tradition and Arab nationalism be reconciled with democracy and equality. In the meantime, it does seem as if the issues which dominated both the Arab world and the West in recent years – the Israeli- Palestinian conflict and radical Islam – no longer occupy center stage. Arab masses above all want better economic and social conditions. Finally, Iran appears to be the main beneficiary of the turmoil, since its strongest opponents, the so-called pragmatic rulers, are busy with their internal problems – which some say Iran has actively promoted. The writer is a former ambassador to Egypt and a fellow at The Jerusalem Center for Public Affairs. AMMAN, Jordan — King Abdullah II, struggling to stave off growing public discontent, widened his political outreach on Thursday and met with the Muslim Brotherhood for the first time in nearly a decade. He also asserted in a statement that he would fight corruption and foster a broad national dialogue. A Muslim Brotherhood leader, Zaki Bani Rsheid, said earlier in an interview in his Amman office that the newly appointed prime minister, Marouf al-Bakhit, had offered the movement a role in his government but that it had turned him down. The Muslim Brotherhood is estimated to have the support of 25 to 30 percent of Jordan’s six million people. It was expected to lead modest demonstrations on Friday calling for democratic steps, although others who had taken part in past weeks said they would hold off and evaluate the nature of the new government. On Tuesday, after weeks of low-level protests demanding change here — and after huge street revolts brought political upheaval to Tunisia and Egypt — Abdullah fired his cabinet and appointed Mr. Bakhit prime minister. The king publicly instructed him to pursue democratic reforms and reach out to a broad range of constituents. Mr. Bakhit has held many consultations in preparation for forming his government, in itself a rare step here. Abdullah, who turned 49 on Sunday and has been on the throne for 12 years, is clearly shaken by events in the region and in his own country. He has been paying surprise visits in recent days to poor areas and villages and ordering assistance to the families he has encountered. Thursday’s statement acknowledged the failure of recent efforts at reform, blaming “people who put their personal interests above the public interest, fear of change and hesitation in making decisions.” It said the king expected the new government to start a comprehensive national dialogue that included all segments of society. Few predicted imminent danger to Abdullah, given the long devotion to his family among Jordanians. But complaints against the king, once largely unheard of, have been growing markedly. Iran perceives the Egyptian revolution as the direct continuation of the Islamist revolution of Ayatollah Khomeini. In Tehran’s view, the events in Egypt validate Iran’s political doctrine, according to which “true Islam” is the only alternative to the decades-long American hegemony in the Middle East and the path toward independence and the resurrection of the Islamic nations. Iran has stressed the similarities between the two nations and added that the fate of Mubarak will be similar to that of the Shah. The Iranian Parliament has also condemned “Zionist and Western efforts to break the spirit of the revolution.” Speaker Ali Larijani said, “If the Americans are in real pursuit of democracy in Egypt, they should let the Egyptian people make their decision; in such a case they (the Egyptians) will show their hatred for the U.S.” He added, “The time has come to overcome puppet autocratic regimes by relying on Islamic teachings.” The Iranians have also highlighted the anti-Western and anti-Zionist character of the demonstrations. Iran pointed out that the developments in Jordan and Egypt attest to the emergence of political Islam, which will lead to the complete encirclement of Israel and enable them to “avenge 60 years of Israeli crimes in Palestine” – according to the commander of the Basij (the voluntary militia of the Iranian Revolutionary Guards). Iran has viewed Egypt as a traitor for paving the way for normalization between Israel and the Arab world and thus playing into U.S. hands. Iran even severed diplomatic relations with Egypt after it signed the peace treaty with Israel and provided political asylum to Shah Mohammad Reza Pahlavi. Now, Iran sees an opportunity to reverse this trend as the Arab streets in Egypt and Jordan are no longer limited by the pro-Western regimes in publicly expressing their hatred toward Israel and the West. Iran will exploit the current changes to advance its Islamic agenda in order to deepen Israel’s isolation in the region and will try to bring about the termination of the peace treaties with Israel. In 1982, Iran issued a postal stamp in memory of Khalid Islambouli, Sadat’s assassin, and even named a street after him in Tehran. In Tehran’s Martyrs Museum, he is remembered along with Ahmed Yassin, Yehye Ayash, Fathi Shaqaqi, Hizbullah’s former Secretary General Abbas al-Musawi, and Imad Mughniyah. Iran hopes that Islambouli’s standing in Iran will sway the Egyptian street and help turn the Middle East into Islamist territory under its influence. Lt. Col. (ret.) Michael (Mickey) Segall is an expert on strategic issues, with a focus on Iran, terrorism, and the Middle East. Analyst Reva Bhalla examines the different political strategies pursued by the Muslim Brotherhood in Egypt and Jordan. Editor’s Note:Transcripts are generated using speech-recognition technology. Therefore, STRATFOR cannot guarantee their complete accuracy. Today, Jordanian King Abdullah II decided to dissolve the government, and asked for a new Cabinet to be formed. Now obviously the timing of the events in Jordan are critical, as the Hashemite monarchy in Jordan is watching events play out in Egypt. This isn’t necessarily a sign of a domino effect taking place in the region and in fact there are very important factors to keep in mind when comparing the situation in Egypt versus Jordan. Jordan deals with its opposition very differently than the Egyptian government has, for example, the Jordanian government has more of an accommadationist approach with its opposition. The Jordanian Muslim Brotherhood’s political arm, the Islamic Action Front is recognized as a legitimate political entity in Jordan even though it is still struggling to adequately represent itself in the parliament. Tensions in Jordan have really been simmering since the parliamentary elections that were held in November last year. The Muslim Brotherhood’s political arm hotly opposed those elections, particularly an electoral law that they argued favored pro-monarchy areas in rural parts of Jordan. Since then, the group has been demanding a lowering of prices in food and fuel, they’ve been demanding a change to the electoral law and they’ve been organizing these mass demonstrations and sit-ins that have been peaceful. Now one thing to note is that they are not demanding regime change, unlike the situation in Egypt. The political arm of the Muslim Brotherhood sees an opportunity right now and they’re basically just trying to take advantage of the current situation to push their own political demands. The Jordanian government has already announced a $452 million subsidy plan to bring down the price of food, to bring down the price of fuel, to increase pension, and things of the sort to basically accommodate the opposition. In other words this is not so much a crisis point like we’re seeing in Tunisia and Egypt, this is more of government trying to maintain the upper hand in trying to rush toward accommodation in preventing a larger conflagration. The image that Jordan is portraying right now in conceding to these demands could carry significant repercussions beyond Jordan’s borders, particularly if the events in Jordan are perceived as an Islamist organization being successful and forcing a regime like the Hashemite monarchy to bend to their demands. This could not only inspire other fledgling opposition groups in other countries to attempt the same, but it could also further embolden the Muslim Brotherhood in Egypt. The Egyptian Muslim Brotherhood is playing a very careful game right now. I think the Brotherhood is very well aware that the romanticism of the revolution in the streets could wear off the longer the people go without a regular supply of food, without security, and most important without results. It’s become clear so far that Mubarak does not have any intention of leaving anytime soon. At the same time, the Muslim Brotherhood needs to sustain the momentum in the streets right now. What they want to avoid is having people think that “Look, I waited three decades to get rid of Mubarak, I can wait another eight months until September elections for him to be deposed.” At the same time, the Muslim Brotherhood is very conscious of the negative connotations associated with its Islamist branding and for that reason it’s trying to reach out to certain secularist leaders for example, Mohamed ElBaradei, who may lack credibility but at least he’s a secular leader that a lot of people can at least look to for some sort of leadership while the Muslim Brotherhood works on creating this political opening that they’ve been waiting for for decades. The media in different Arab countries have taken varying perspectives on the recent events in the Arab world, specifically the ousting of Tunisia’s former leader Ben Ali, the violent demonstrations in other Arab countries, especially in Egypt, Jordan and Yemen, and the overthrow of the Al-Hariri government in Lebanon. Saudi journalists have held Iran responsible for the events. The Iranian press has concurred with this interpretation, presenting the developments as a victory of the resistance camp, led by Iran, over the West, led by the U.S., and predicting that other pro-Western Arab regimes will soon go the way of Tunisia’s former regime. The editor of the London daily Al-Quds Al-Arabi, ‘Abd Al-Bari ‘Atwan, who over the years has opposed the West and expressed support for Osama bin Laden and Saddam Hussein, said that the U.S. and Israel were the parties most deeply concerned by the events, for they were the ones bound to suffer the most from the collapse of the pro-Western Arab regimes. The weekly Sobh-e Sadeq, which is close to the Revolutionary Guard Corps, said that the crisis in Lebanon has regional repercussions that are extremely damaging to the U.S. It added that the Saudi-Syrian initiative had failed because Saudi Arabia’s moves, made on behalf of the U.S., were aimed solely at buying time until the release of the Special Tribunal for Lebanon (STL) indictment. According to Sobh-e Sadeq, Walid Jumblatt’s joining the Syria-Hizbullah camp was a turning point that rendered Prime Minister Al-Hariri superfluous. The paper praised Hizbullah for its wise moves, pointing out that contrary to the dire predictions made by Israel, Saudi Arabia, and the U.S., as well as by certain circles and figures in Lebanon such as Samir Geagea, Hizbullah had not turned to violence but had maintained a patriotic stance on the political, media, and security levels. Sobh-e Sadeq assessed that following the Tunisia uprising, the pro-American Arab regimes are bound to collapse one by one, like dominos. Responding to the appointment of Najib Mikati, the candidate of the Lebanese opposition, to form the new Lebanese government, Saudi liberal columnist ‘Abdallah bin Bjad Al-‘Otaibi wrote that this was the doing of Hizbullah Secretary-General Hassan Nasrallah, who served as Khamenei’s official representative in Lebanon. A similar position was expressed on January 27 by an analyst in the Saudi daily Al-Jazirah. Kayhan (Iran), January 26, 2011. Sobh-e Sadeq (Iran), January 24, 2011. This is a reference to the fact that the demonstrations were organized through Facebook and Twitter. Al-Sharq Al-Awsat (London), January 27, 2011. Okaz (Saudi Arabia), January 26, 2011. Al-Quds Al-Arabi (London), January 27, 2011.